A clear jelly - the vitreous or 'vitreous jelly' - fills the middle of the eye. 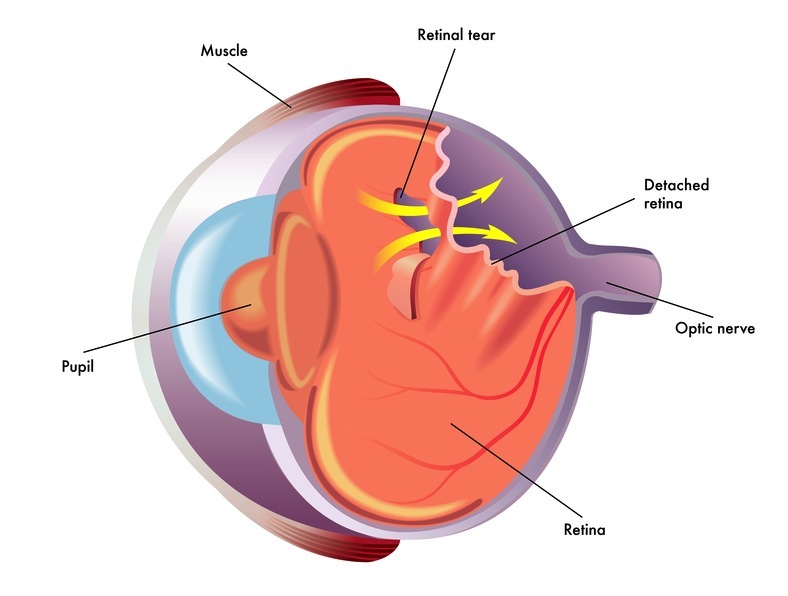 The vitreous lies against the retina in a normal eye. It is transparent like glass, so light passes through it to reach the retina; the retina is the film that lines the back of the eye. As you get older the vitreous may shrink away from the retina. This may happen earlier if you are short sighted or have injured your eye. This shrinking process may happen rather suddenly, that is over a few days. This process is called posterior vitreous detachment. The eye still sees well with a shrunken vitreous: the shrinkage is essentially like a jelly liquifying, and no harm comes to the eye. The vitreous may shrink in different ways. Third, you may develop floaters. Tiny amounts of pigment may come off the retina, into the vitreous, and this may cause floaters. You may see these as a spiders web or veil over the eye. The floaters disappear a little, and become less noticeable, over a few weeks or months. Floaters are naturally much more noticeable if you only have one good eye (and this process is happening in your good eye). Less commonly, the vitreous may pull the retina and make a small retinal tear, or even less commonly, a detached retina. What is the treatment for Posterior Vitreous Detachment? There is no treatment that will put the vitreous back in position. The floaters and veil that may have drifted across your sight subside by themselves. You may notice a large floater for a long time, which is a nuisance; the doctor can not remove this. Most people become accustomed to the floater or floaters, and with a little effort ignore them. Tears are uncommon, but if one develops, laser treatment around it, or freezing therapy, may be necessary to prevent the tear becoming larger. If the doctor checks your eye and all is well, the floaters and flashes subside. However, you usually need a further examination if you suddenly develop a lot more flashes or floaters (this could be a small tear). You will also need further examination if a shutter or curtain of blurred vision drifts across your eye, sometimes from below. To check for this, cover one eye at a time for a few seconds every day. If the eye you have not covered sees well in all directions, all is well. If an area of poor sight drifting across your vision does occur, then you will need to have your eyes checked the same day or the following morning to determine whether or not there is retinal detachment.